'Linga' is a privately owned timber-built chalet occupying a secluded position overlooking Inverkirkaig Bay. 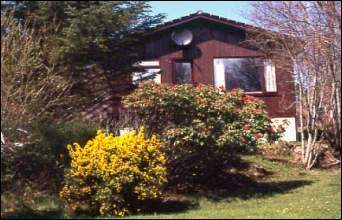 The site, formerly a croft, extends to around 2 acres, and is shared with 7 other chalets, also privately owned. Inverkirkaig itself is a tiny crofting community set in the heart of the magnificent landscape of the Northwest Highlands. 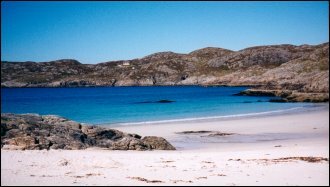 Lochinver, the nearest village, is approximately 3 miles to the north. Set in the heart of the magnificent landscape of the north-west Highlands, 'Linga' provides a comfortable and convenient base for exploring and enjoying the wonderful, unspoilt coastal and mountain scenery of Assynt, Wester Ross and beyond. Large open-plan living area (kitchen, dining area and lounge). 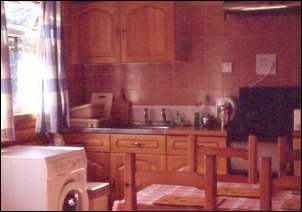 Kitchen with electric cooker, microwave oven, fridge freezer and automatic washer dryer. TV with digital reception in the lounge. Fully equipped, including bed linen and towels. Lochinver is a busy little fishing port with stores, newsagents, bank, filling station, post office, craft shops and bistro. hill walking, mountaineering, angling, photography and bird watching, etc. For those interested in the natural world, there is much to see and enjoy. The plant life and geology of Assynt are particularly notable, and a wide variety of wildlife including eagles, buzzards, ospreys, deer, pine martens, otters, water-fowl and seals can all be observed. There are superb beaches within easy reach, ideal for family days out, and for those who merely wish to relax amidst peaceful and beautiful surroundings, the area is simply unbeatable. There are many spectacular coastal drives, while the more energetic may wish to climb mountains such as Canisp, Conival, Foinaven, Cranstakie, Stac Pollaidh, Cul Mor and Cul Beag. Ullapool is about an hour's drive to the south while Durness to the north can be reached in an hour and a half. A non-returnable deposit of �50 per week is required to confirm a booking. The balance should be paid no later than six weeks before the start of the holiday. The chalet will be available to guests on the day of arrival from 4.00 p.m. and should be vacated on the day of departure by 11.00 a.m. to enable cleaning and maintenance. Electricity charges are included in the rental. Modern storage heaters provide heating in the living room and bathroom, and wall-mounted convector heaters are available in the bedrooms when required. A telephone is available for incoming and emergency calls only. There is a public telephone kiosk close by. 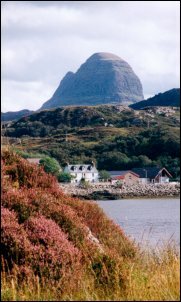 Mobile reception is unavailable in Inverkirkaig but is possible in Lochinver.